"Whiskey" Dave Perkins and his ever-expanding High West Distillery & Saloon crew are nothing if not enmeshed in the heritage of the Old West. Their soon-to-open restaurant and distillery is located at Blue Sky Ranch near Wanship, a working ranch that embraces the traditions of the American West, replete with horses, cattle and Western-style adventures. The labels on bottles of High West products have always captured snippets of the West. Valley Tan Utah Oat Whiskey carries a mug shot of Porter Rockwell—Brigham Young's infamous "enforcer"—on its label ("valley tan" originally referred to the leather made by Mormon Pioneers). High West's inaugural whiskey—Rendezvous Rye—pays homage to the annual gathering of mountain men in the West where they exchanged pelts for supplies; it was called the summer rendezvous. High West Silver Whiskey is named for the silver mines of Park City, home to High West Distillery and, at one time, one of the richest and most productive silver towns in the old West. In keeping with the "Onward!" 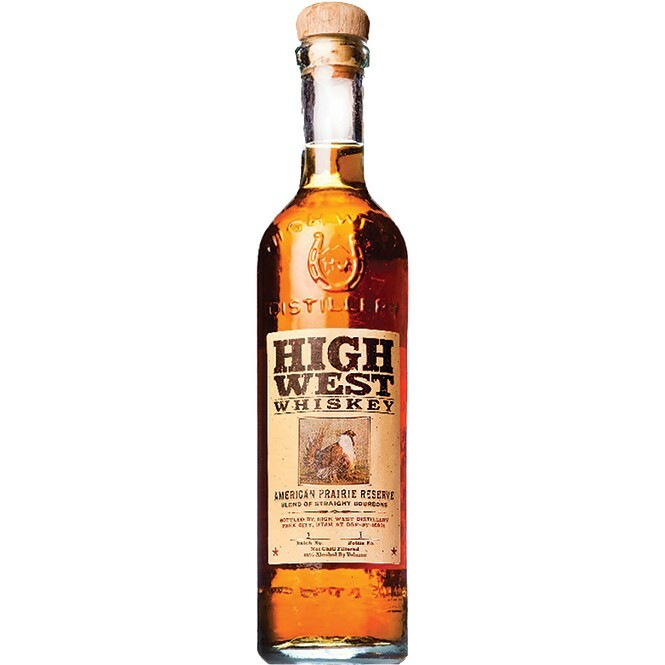 spirit of the West, High West has launched a new whiskey offering: American Prairie ($34.99/750 mL). It's a blend of 2-year-old, 6-year-old and 13-year-old straight bourbons (the exact percentages are a secret) that is neither chill-filtered nor carbon treated, and it is aged in new, charred, white American oak barrels. Dedicated to "preserving and promoting the American West," High West is putting some of its money where its mouth is with this one. The American Prairie Reserve in Montana is a 5,000-square-mile land tract—nearly the size of Connecticut—that's being restored to "what Lewis and Clark and Native Americans would have seen," according to High West. When complete, it will be the largest wildlife preserve in the lower 48 states—larger than Yosemite, Yellowstone and Grand Teton National Parks combined. High West will donate 10 percent of after-tax profits from every bottle of American Prairie Whiskey to the American Prairie Foundation to aid its work on the American Prairie Reserve. The label for American Prairie Whiskey features a pronghorn antelope—North America's fastest land mammal, clocking in speeds of 55 mph. According to the folks at the American Prairie Reserve, the pronghorn antelope has seen a population decrease since the 1800s of 98 percent, due to habitat destruction. The American Prairie Reserve is helping the pronghorn through ongoing fence removal efforts and by conserving wildlife corridors. I'll drink to that! So, how does High West American Prairie Whiskey taste? Thick and rich. For folks who enjoy the honeyed whiskeys that are so popular these days, I'd suggest giving American Prairie a try. It's a little like biting into a bourbon-soaked candy-caramel apple, with sweet honey, apple and caramel notes, plus hints of cinnamon and allspice. Maybe calling it "Mom's Apple Pie Whiskey" would be closer to the bone. And for whiskey connoisseurs, High West Bourye ($80/750 mL) is back, with a slightly different taste profile (the High West distillers like it better) than the original Bourye. It's a premium blend of 9-year-old bourbon along with 10-year-old and 16-year-old straight rye whiskeys, delivering a long, sweet finish and nutty caramel and honey flavors on the palate. This is a whiskey made for sipping, unadulterated by anything but perhaps a teardrop's worth of water. Look for the mythical Western jackalope on Bourye's label. Legend has it that "the best way to catch a jackalope is to lure it with whiskey," say the creators of Bourye—and, they assure us, their whiskey is "sure to attract the most finicky of jackalopes."